The plastic crisis has captured the world’s attention. Since David Attenborough’s Blue Planet II, public consciousness has become consumed with plastics. 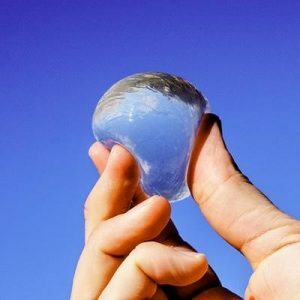 This increased attention has inspired global action including intergovernmental plastic pacts, plastic bag taxes, banning drinking straws, plastic-free supermarket isles – and even new ketchup packets made from edible seaweed membranes. It is a relatively rare event for independent environmental initiatives all over the world to converge on the same issu e at the same time. But while global enthusiasm boils away, the magnitude of the crisis increases exponentially. Every day we dump 8 million pieces of plastic into the oceans. In 2016 we produced 320 million tonnes of plastic. This is set to double by 2034. At the heart of the problem lies our addictive relationship with single-use plastic. A consequence of today’s throw-away consumerist culture is that we no longer value the materials that enable and facilitate our modern consumption habits. When we eat a packet of crisps, few stop to consider the provenance or environmental footprint of the packaging. A hackathon (A.K.A. hack day, hackfest or codefest) has its roots in computer programming, and is a competitive sprint-like event where teams collaborate on strategic problem-solving. Attendees included designers, engineers, entrepreneurs, behavioral scientists and high-school students. These diverse minds collaborated in small teams to create innovative business ideas to tackle single-use plastic. They then pitched these ideas with entrepreneurs and investors ready to put them into practice. The challenge for the event was Reuse and Refill. From the perspective of human behaviour, these pose some of the toughest challenges. Many of the latest innovations in consumer products and services owe their success to increasing the convenience in our lives: think Alexa, Deliveroo, and Uber. Imposing a ‘friction cost’ of increased effort on the consumer goes against this grain. But this is an important behavioral challenge to overcome, as reusing and refilling (after avoiding all altogether) are the most effective means of avoiding plastic waste. It was commonly agreed that consumers already understand the nature of the problem. Clearly more awareness campaigns were not going to result in the scale of behaviour change necessary. Leveraging defaults was a popular theme in many discussions, as studies have demonstrated that consumers are significantly less likely to request a plastic straw or carrier bag when they aren’t offered. Incentivization is also clearly relevant, as the nominal 5p charge on plastic bags in the UK has resulted in an 83% reduction in plastic bag usage. Small financial disincentives might be especially powerful for plastic items which are currently given away to consumers, a behavioral bias known as the power of the free. The hackathon generated some great ideas on the day. My favorite was to reduce the waste caused by the small size toiletries many of us are forced to buy to comply with airplane rules. The solution involves delivering ‘vacation-portion’ cosmetics direct to your airplane seat. The reusable containers are then returned on the way home, avoiding both hassle and plastic waste. Another great idea was a lunchtime Tupperware subscription service for office buildings, which would partner with local restaurants. Participating in this Plastic Hackathon reminded me of the value of collaborating across diverse disciplines and sectors, and the important role behavioral science plays in innovation to tackle sustainability challenges. Perhaps most importantly, adopting a solutions-based mind frame can inspire hope, belief and action! We face severe environmental challenges that have the potential to overwhelm and paralyse us. It’s vital we don’t succumb to pessimism and inaction. Saul Wodak is a Behavioral Science Researcher at H+K Smarter, Hill+Knowlton Strategies’ behavioral science unit. Solving global environmental challenges requires committed action from governments, companies and individuals. Behavioral science is an ideal tool to contribute to meeting these challenges, as human behavior lies at the heart of human cooperative endeavors. For example, it is estimated that behavior change solutions could contribute up to 20% of global emissions reductions. H+K Smarter works alongside Better Impact, H+K’s strategic and measurable approach to supporting brands have a better impact on our planet. Recent projects have applied behavioral science to increase battery recycling, reduce office energy consumption and reduce the use of take-away coffee cups. Hawken, P. (Ed.). (2017). Drawdown: The most comprehensive plan ever proposed to reverse global warming. Penguin.